Welcome back to another installment in the Wacky Powers series in which we look at Daredevil doing truly strange things. Once again, we’ll be looking at a case of Daredevil using his radar sense as bona fide flight radar. Thankfully, we haven’t seen much of this strange power for the last forty years, but it kept rearing its strange and ugly head from time to time, during the first ten. 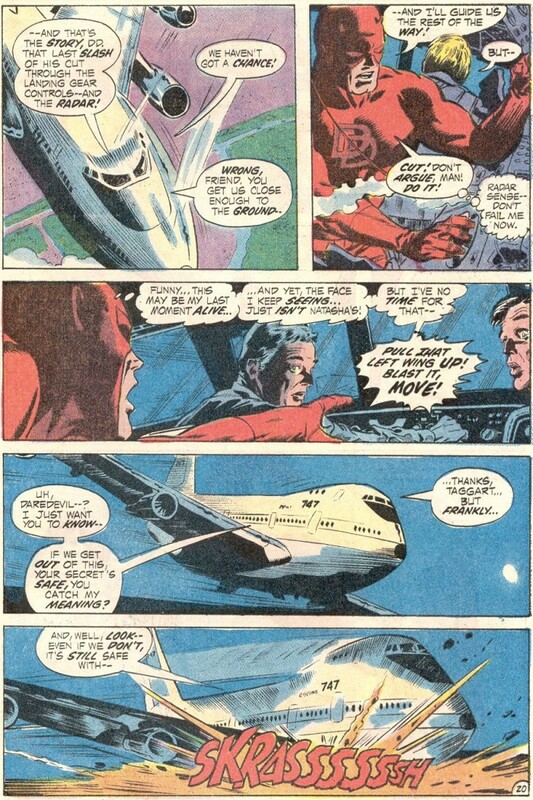 What makes the scene below, from Daredevil #85, particularly hilarious is that it’s clear that the actual pilots of the Boeing 747 that provides the stage for this issue, by Gerry Conway and Gene Colan, are clearly within visual range of where they decide to land. Daredevil asks them to take the plane lower so that his radar sense can do its magic, but that would also allow for them to get the plane down safely just by looking at the terrain. In essence, they should be looking out the window, not at Daredevil while acting completely helpless. Also, what the hell is Daredevil doing trying to tamper with the equipment? For me, there are two major problems with the suggestion that Daredevil’s radar sense could act as flight radar. The biggest one has to do with the science of it (or lack thereof), which I’ll return to below. But, just as importantly, every time Daredevil is called on to do something this extreme, it also introduces some major inconsistencies into how the character normally behaves. While there is good reason to take most of what’s written in the MUH with a grain of salt (I have no idea whether creators are in any way required to abide by it – I suspect not – and it also contains highly questionable information pertaining to how the senses work in real life), it at least gives us some idea of what Marvel considers reasonable. You might argue that it’s superhero comics, so anything goes. But I don’t think even comic book publishers and creators agree with that, or else they wouldn’t feel compelled to try to explain how it is that certain characters can fly (such as by suggesting a mystical external power source). The explanations are always bogus of course, but there always needs to be at least an attempt at addressing the issue to allow readers to suspend their disbelief. And, characters need to abide by the rules that have been laid out for them, or else the illusion that these stories make sense start to break down. If Matt Murdock started sticking to walls for no reason, and Peter Parker woke up on morning and started hearing heartbeats, readers would like to know why. And, given the usual parameters of Daredevil’s power set, we really shouldn’t expect him to be able to land airplanes. That’s just wacky.